Thank you for joining us in The Crime Lounge, put your feet up and get comfortable. 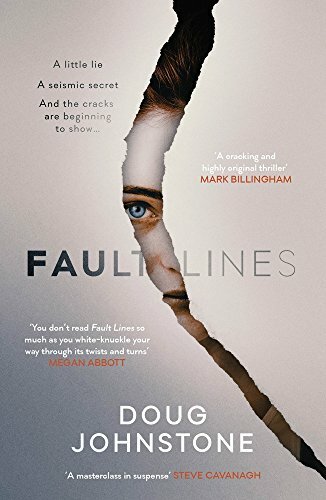 Describe your latest novel, Fault Lines in three words. I tend to spend a couple of months before writing the first draft just researching, planning and plotting stuff. The research is usually all pretty loose, though, it’s just about absorbing as much as I can about the characters, locations, situations, themes and so on. By the time I write the first draft I have thousands of words of notes, but I never check back through them, I prefer to write the first draft with the essence of that stuff in my mind, rather than worrying over laborious detail. Then if there’s stuff I’ve missed, I can sort it in the next drafts. Well the book I’ve just finished the first draft of is set in a funeral directors, and I used a lot of my own experience because I was Writer in Residence at a funeral directors in Edinburgh for six months. That was a really fascinating job, where I interviewed all the staff and shadowed them at work, so I did body collection, funeral arranging, sat in on embalming, cranial reconstruction, actual funerals and so on. It was all an amazing experience to see how that industry works from the inside. I found that I wasn’t squeamish about working with the deceased, but I found the emotional stress of dealing with the bereaved hard to take. I have huge respect for anyone working in that industry. Do you feel like your writing style is still evolving? Yes, absolutely. I hope it is, anyway! You learn something new from every book you write. I’ve had nine novels published, and each one has taught me something. For instance, I don’t feel that I’m a natural plotter, and my early books were very simple in terms of plot. But I’ve worked on that a lot, so hopefully the plots of my later books are more satisfying for the reader in that respect. And you’re always challenging yourself with each book you write – whether it’s something new in terms of style, character, setting, themes and so on. That funeral director book I mentioned before is very different for me in a number of ways, and that was absolutely deliberate in an attempt to stretch and test myself and my writing. Who do you think are the authors shaping the thriller genre now? Oh man, there are so many great writers out there in the crime and thriller genre. I’ve always liked writing that’s on the edges of the genre, so writers like Megan Abbott, Laura Lippman and Sara Gran, all of whom have terrific new books out this year. Don Winslow is writing extraordinary books at the moment, The Force is incredible. And I’ve just discovered a Brooklyn writer called William Boyle whose first novel Gravesend absolutely blew me away. It can be quite hard to surprise other writers in the genre, but that book had me double-taking all the way through. And my own publisher Orenda have loads of great thriller and crime writers doing interesting and innovative new things. My favourites at the moment are Agnes Ravatn, Lilja Sigurdardottir, Simone Buchholtz and Matt Wesolowski. So happy to be published alongside them.